How much money can you make from £25 to celebrate Weldmar’s 25th year? 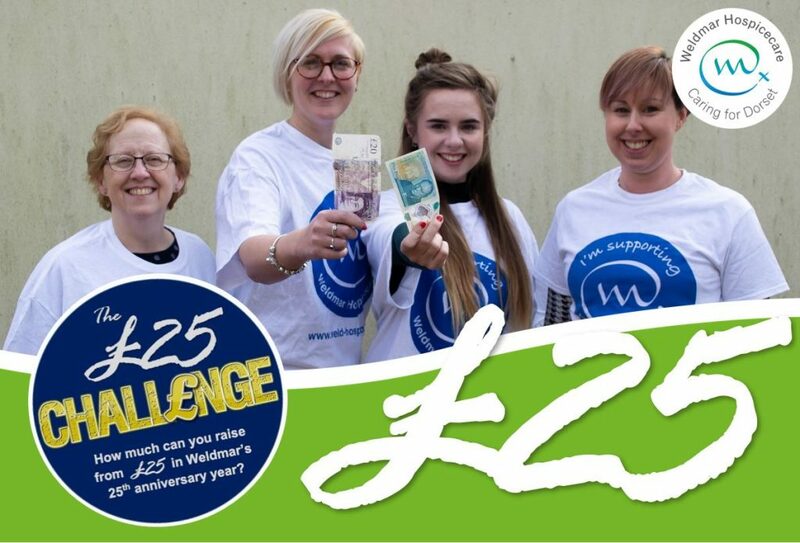 Will you take on the £25 Challenge for Weldmar? Join teams of businesses, schools and community groups from all over Dorset and raise as much money as you can from £25. You could organise a one-off event or a whole series of fundraisers throughout the four month long campaign. We will support you with your fundraising ideas, feature your support on our website and social media as well as mention you in a post event press release. You will also receive a certificate and an invite to an award ceremony following the campaign to recognise and celebrate your efforts. FIND OUT MORE: Come along to the campaing launch on Wednesday 1st May at our inpatient unit from 5pm – 6.30pm. You will find out more about Weldmar Hospicecare, this challenge and recieve your £25 cash to start you off!